• الموضوع : Mohamad El Husseini meets with the Chief Rabbi of the Jews in Europe Albert Guigui in Brussels . 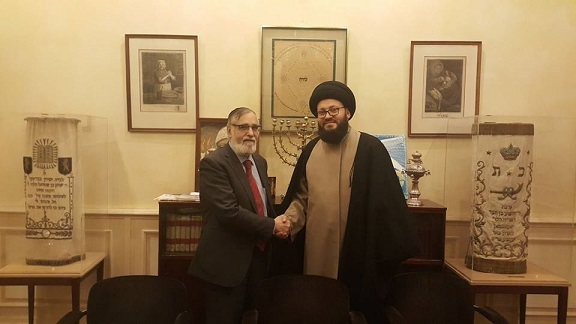 The secretary-general of the Arab Islamic Council, Sayed Mohamad Ali El Husseini met with the Chief Rabbi of the Jews in Europe Albert Guigui in Brussels. Furthermore, Sayed El Husseini stressed on the issue of dialogue between religions and its necessity and importance in preserving Islam as well as preserving peace, security and stability around the world and called for allocating special attention to the Islamic-Jewish dialogue. Sayed El Husseini stressed on the importance of Islamic-Jewish dialogue for several reasons; as the development and uprising of the current political situation specifically in the Middle East calls upon religious clerics from both religious and urges them to spend all their efforts towards finding a suitable platform for a positive dialogue that enriches the humanitarian relations between the two religions and pushes such relations towards serving the concepts of goodness, truth, tolerance and peace. This is on the basis of mutual understanding and peaceful coexistence between the two religions away from politics and based on what was previously mentioned. Sayed El Husseini concluded his meeting with Rabbi Guigui with statements that we as Arab Muslims and you as Arab Jews – indicating the Moroccan roots of the Rabbi Guigui- have lived together for hundreds of years – before being separated by the evils- in peace and love as a family, neighbors, and dears. I hope that we meet again and live together as we have in the past.